Spaghetti Squash Pizza Casserole - a great pasta alternative! 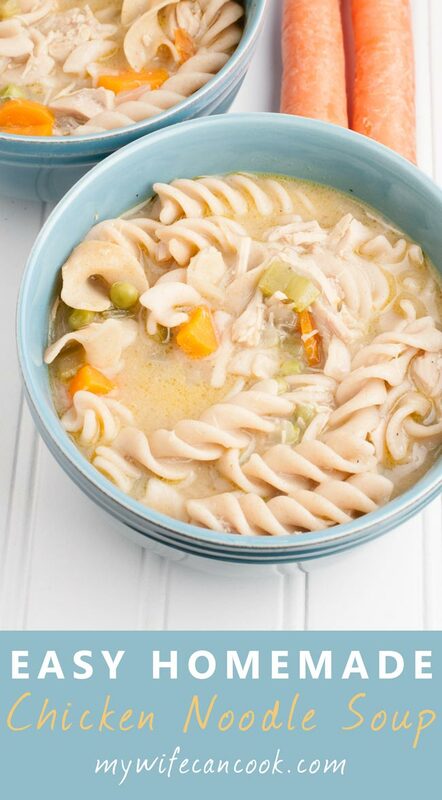 Anyone else always looking for healthy casserole-like recipes to prep ahead of time and cook quickly on a busy night when everyone is moving in opposite directions? We came up with our quinoa fajita casserole for this very reason–well, that and the fact that it’s delicious. 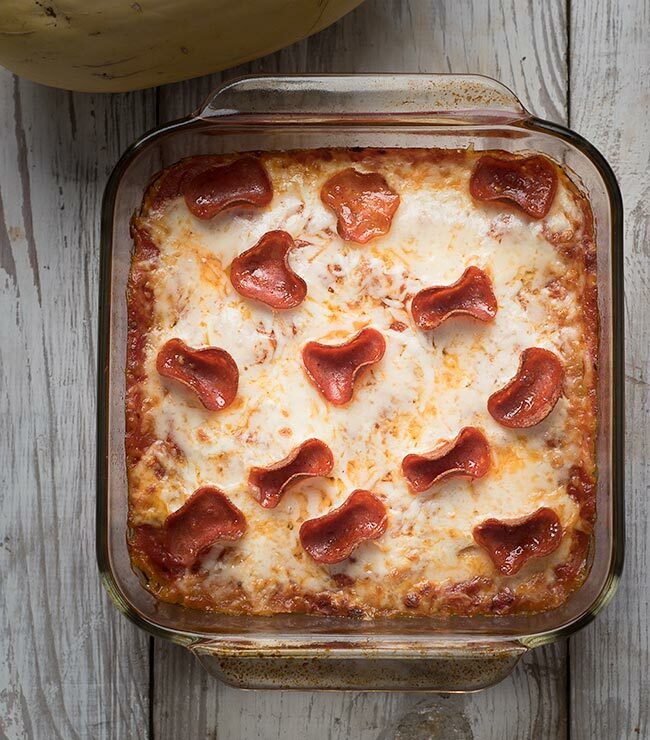 Our newest addition to this healthy casserole lineup is this spaghetti squash pizza casserole. When did spaghetti squash become so popular? Was it when the Atkins diet became popular? Or paleo? Regardless, if you haven’t tried it, I would recommend it. Spaghetti squash isn’t exactly like spaghetti so don’t expect it to be an exact flavor and texture replacement. 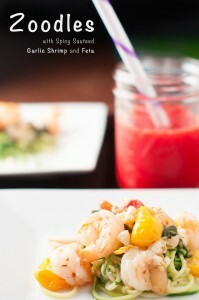 However, if you add some delicious sauce, cheese, and herbs and I think you will love it. The hardest part of cooking spaghetti squash is cutting the squash open. You will need a large, sharp chef knife. Cut it open, scoop out the seeds, then season with extra virgin olive oil and salt and pepper. Place cut side down on a large foil-lined pan (the foil isn’t necessary, but does help with clean up). Roast in the oven for probably an hour (I like to roast until you get some brown caramelization on the cut edges). Alternatively, if you have trouble opening one, you can sometimes find it halved at the grocery store or you can follow the Martha Stewart method and roast your spaghetti squash whole. Hey, if Martha has instructions on how to do it, it must be okay, right? 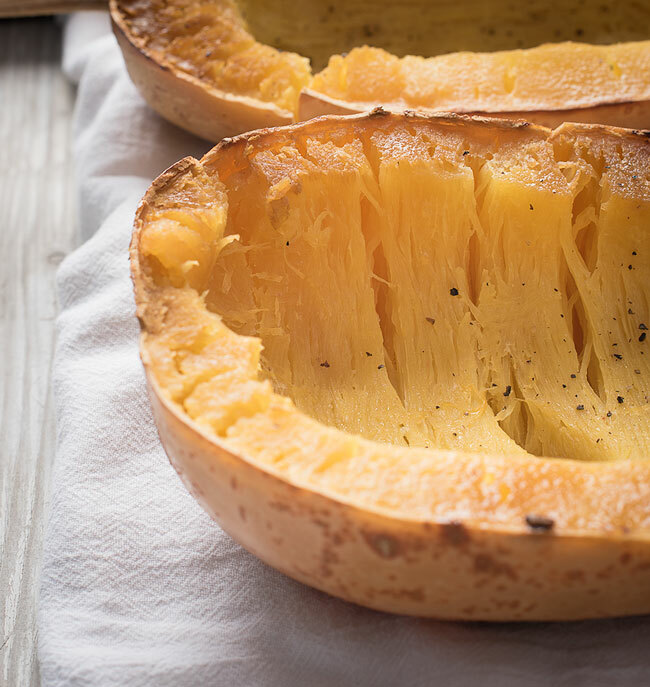 Once the squash has finished roasting (you can test it by using a fork to see if it easily pulls away from the skin in spaghetti-like strands), use a fork to shred the insides out into a paper towel or flour sack towel-lined colander. Press out any extra liquid. Then place in a greased 8 x 8-inch pan. 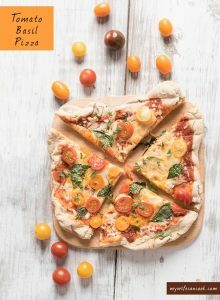 Top with the pizza toppings and either cook right away or save for a crazy busy night you need a quick meal in your back pocket. We have probably stretched it to 4-5 days when I forgot it was there and waiting. If you save it, wait to top it until the night you are cooking it. Sure, sometimes we still eat pasta. Our kids eat it a lot. But it’s a little harder to get away with it in our grown-up years so we’ve really become fans of spaghetti squash casserole. 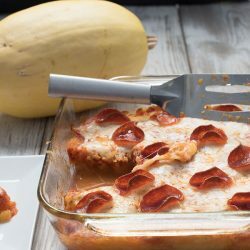 Recently we’ve been making spaghetti squash pizza casserole where we add in the pepperoni on top to try to bring our kids around and they are starting to eat it more often. We find our kids hear the word pizza and they’re more likely to eat it…then again, our family loves pizza. But the pepperoni part is totally optional. You can make spaghetti squash pizza casserole or keep it vegetarian and just make spaghetti squash casserole. But whatever you do you have to at least give spaghetti squash a try and see what all the fuss is about. Cut squash in half and rub with olive oil. Season squash with salt and pepper and place cut side down on foil lined pan. Roast in oven for 45 minutes to an hour. Scrape out insides of squash into a paper towel or flour sack towel lined collander and press out liquid. 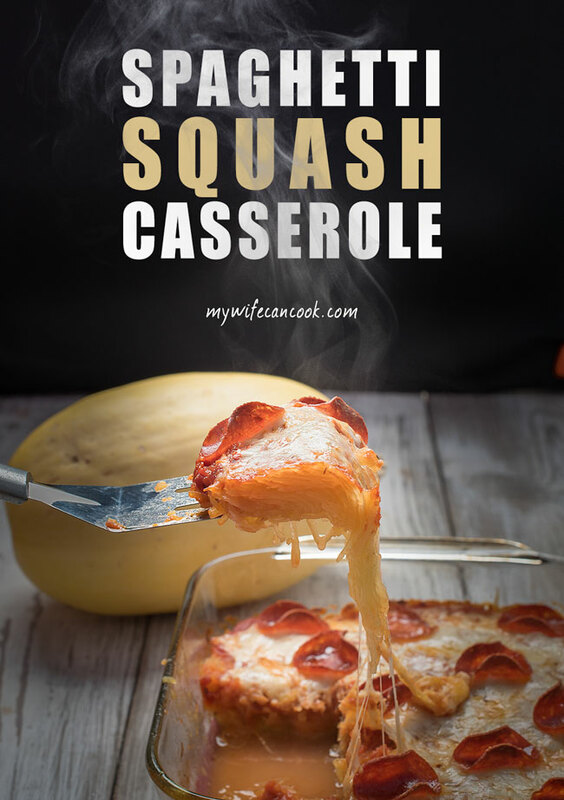 Press squash into a greased 8x8 inch pan. Sprinkle both cheeses over top. Place pepperoni on top of cheese. 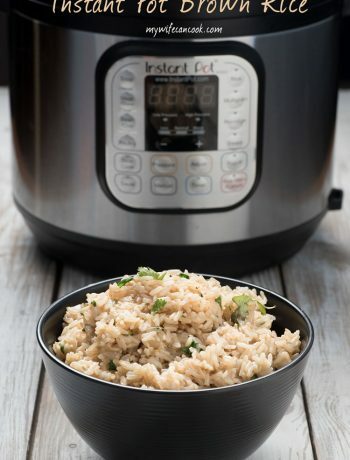 Cook for approximately 20 minutes. Broil for an additional 2-4 minutes if you like the cheese browned and pizza like. Bless mother nature for giving us spaghetti squash. 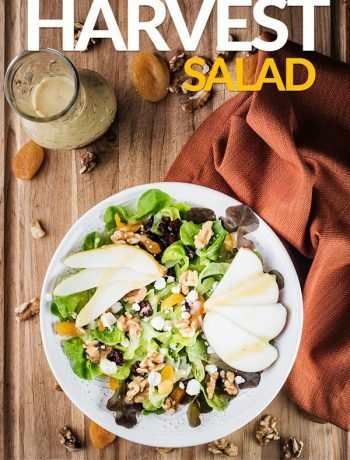 This looks SO delicious, and you’d never know it was low carb and actually good for you! Can’t wait to try this out! Exactly! It’s hard to beat anything with pizza toppings on it. And if it’s healthy as well, even better.